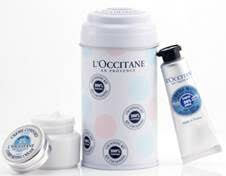 Makeup, Beauty and More: L’OCCITANE is giving away free Shea Butter collector's sets! L’OCCITANE is giving away free Shea Butter collector's sets! Starting (April 13th) you can visit this link and score a FREE Shea Starter Kit, featuring a mini Shea Butter Hand Cream and Shea Light Comforting Cream, in an exclusive collector’s tin! 3) Present email at any L’Occitane boutique nationwide and redeem your FREE Shea Starter Kit.